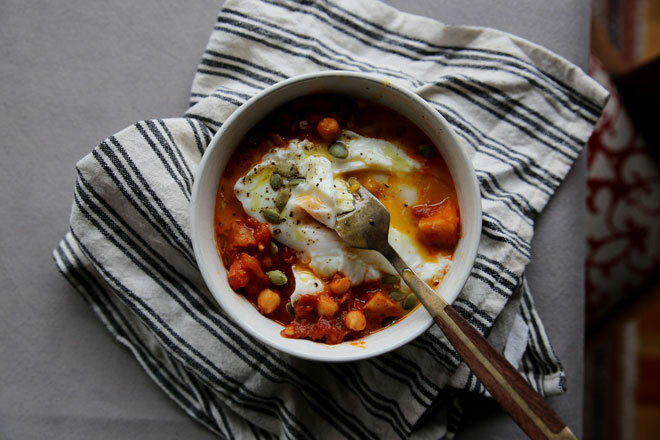 Slow braised chickpeas & potato in a rich sun-dried tomato and oregano sauce, topped with soft poached eggs. A lovely nourishing and comforting meal. Heat the ghee, butter or olive oil in a large heavy bottomed saucepan over medium heat. Add the onions, garlic, sun-dried tomatoes, oregano and honey, and saute until soft and slightly browned (about 10-12 minutes). Add the white wine, and continue to cook while stirring for a further 5 minutes. Add the potatoes, stock, tomatoes and chickpeas, and bring to a soft boil. Simmer on low for 45 minutes, stirring every so often, until thick and pulpy. Season to taste with freshly ground pepper, and sea salt. Serve with poached eggs, and a sprinkle of toasted pumpkin seeds if you desire.